May 19, 2011 – La Mirada, CA – The Glen Helen round of the Lucas Oil Off-Road Racing Series is always one to get excited about, with much of the industry and majority of the drivers being from the Southern California area including Rockstar Metal Mulisha Makita’s Brian Deegan and the Rockstar Makita LeDuc Racing team of Curt, Todd, and Kyle LeDuc. 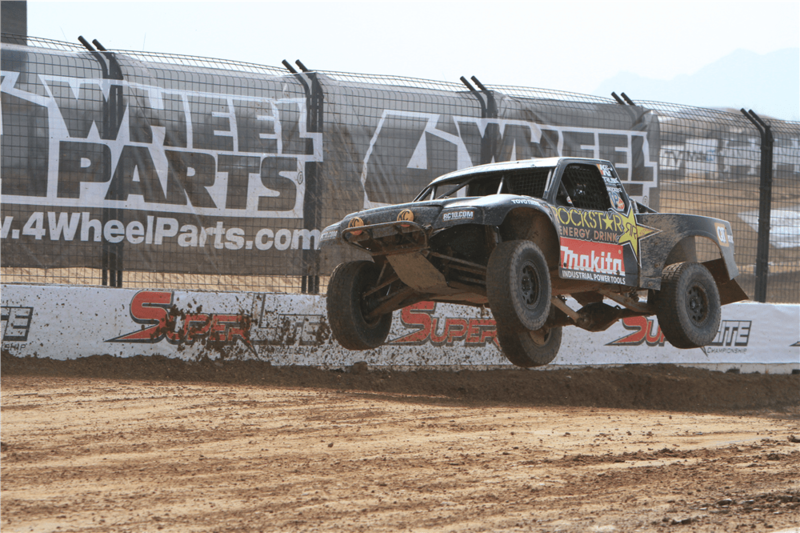 This weekend’s racing will mark rounds five and six of the series, and Brian Deegan comes into this event in second place in ProLite and Pro 2. 2011 is Brian’s first full season in the Pro 2 class and he has adapted extremely well to the new challenge by finishing on the podium several times thus far. In ProLite, “The General” is still the man to beat and as a former champion, is looking to capture another championship. He will face some stiff competition however from the Rockstar Makita ProLite truck of Kyle LeDuc. Kyle is a former champion as well and is hungry for a win in 2011. In addition to all of the racing action this weekend, The Lucas Oil Off-Road Racing Series has dedicated Saturday’s event to Jeff “Ox” Kargola, who recently lost his life after a motorcycle crash in Mexico. Kargola was one of the rising stars of the Lucas Oil Off-Road Racing Series after achieving fame as a freestyle motocross competitor and personality. He will be missed. The 2010 race at Glen Helen was sold out, so organizers have doubled the seating capacity for this weekend’s event. CBS Sports will capture all the action for a broadcast on Sunday, June 12 at 2 p.m. Eastern. Tickets are on sale at www.allisports.com. Makita is a worldwide manufacturer of industrial quality power tools and offers a wide range of industrial accessories. Makita utilizes leading-edge technology and innovation to engineer tools that are more compact with less weight yet deliver industrial strength power and results. Makita’s extensive line of cordless lithium-ion tools includes 18V LXT® Lithium-Ion, 18V Compact Lithium-Ion®, and 12V max Lithium-Ion®. Other best-in-class products include rotary and demolition hammers and saws equipped with Anti-Vibration Technology™ (AVT™), 4-Cycle outdoor power equipment, Super Joint System (SJS) grinders, miter saws engineered with Deep and Exact Cutting Technology (DXT), and more. Makita U.S.A., Inc. is located in La Mirada, California, and operates an extensive distribution network located throughout the U.S. For more information, please call 800/4-MAKITA or visit makitatools.com. Follow Makita at facebook.com/makitatoolspage, twitter.com/makitatools, and youtube.com/makitapowertools. Makita is Best-in-Class Engineering.